Lily Johnson said goodbye to her brothers and sister in Book 1 of the Johnson series ‘Married on the Oregon Trail’. 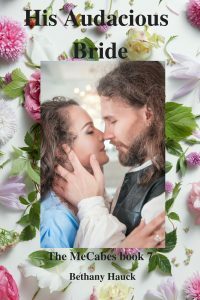 She stayed behind in Paducah to marry Jeremiah Smith, and to get over losing the man she truly loved, Nick Garrett. She finds out that Jeremiah played a role in her parent’s deaths soon after. She blames herself and silently vows never to court a man again. 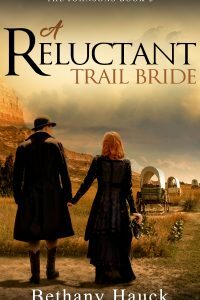 With the threat of war seeming more inevitable each day, John and Victoria Johnson decide to leave Paducah and travel with Lily to Oregon, where her brothers and sister went. It’ll be a fresh start for all of them, as they are joined by another of their grandsons, Mark Roberts. Nick Garrett leaves Paducah heartbroken. He’s glad he was able to leave earlier than planned because watching Jeremiah with Lily is killing him. Nick knows if he doesn’t get away soon, he’ll end up doing something stupid. He travels to Independence, and although his wagon train isn’t leaving for a few weeks yet, he settles in and prepares himself for the journey, while trying to forget about Lily. He’s quite surprised when he sees John and Victoria pull their large Prairie Schooner into the wagon train camp, a few days before the train heads west to Oregon. He’s even more surprised to see Lily standing up behind them, and hanging onto the back of their seat. 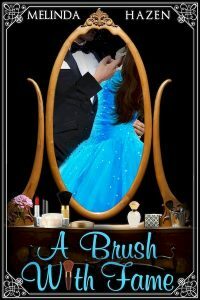 Conditions on the trail are difficult, and many things go wrong, one of which leads to Lily and Nick having to marry. 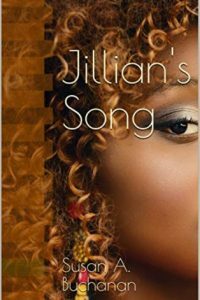 Although everyone else knows the two of them are made for each other, it may take a trip or two over Nick’s knee before Lily figures it out, as she struggles to forgive herself, and go on with her life. 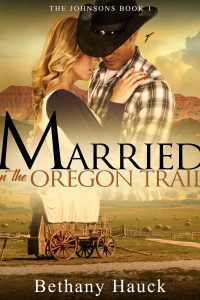 Although this is a stand-alone novel, many of the characters were introduced to the series in; ‘Married on the Oregon Trail The Johnsons Book 1’. Eadan McCabe wants to get away from Gleann for a while after the death of his wife, Nessa. There are too many memories of their life together, good and bad. Although the marriage had problems, he did love his wife. He plans to leave with his son, Eadan Hamish, and his squire. His Grandda’s hunting lodge seems like the perfect place to go for some peace, if he can get his son away from his nurse, Kirstie. 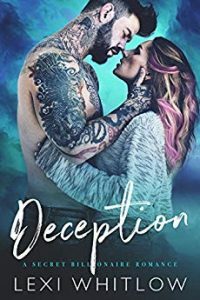 Kirstie Ferguson has many secrets that she’s sworn never to tell anyone. 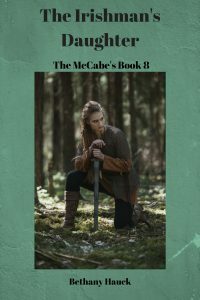 When Eadan Hamish refuses to leave her, she decides to go with him and Eadan to stay at the McCabe hunting lodge. She knows she can’t stay in the Highlands much longer, or she risks begin found by the family she ran away from many years ago. Kirstie decides to make the best out of the time with the lad, who she’s grown to love. Even if the attraction she feels for his Da has to be ignored. Over a few goblets of whiskey Kirstie finally tells Eadan her sad tale. The pair drink more than they realize and end up sleeping together. The next morning they are found, and then marry. Eadan understands why Kirstie is worried, but now that she’s his wife, he’s confident he can keep her safe. 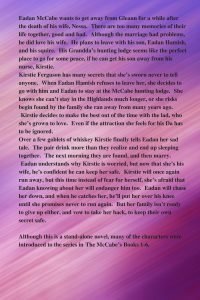 Kirstie will once again run away, but this time instead of fear for herself, she’s afraid that Eadan knowing about her will endanger him too. Eadan will chase her down, and when he catches her, he’ll put her over his knee until she promises never to run again. But her family isn’t ready to give up either, and vow to take her back, to keep their own secret safe. Although this is a stand-alone novel, many of the characters were introduced to the series in The McCabe’s Books 1-6. Although this is a stand-alone novel, many of the characters were introduced to the series in The McCabe’s Books 1-7. My trembling should have made it obvious. But he had to twist my bliss into something humiliating. Stoking the fire inside me even more. Melting away anything that was left of Liane. Leaving only my need. My insatiable appetite. And teased it, taunted it, caged it. Taken it to the depths of pain. Until he owns every secret inch of me. 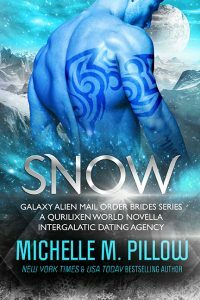 Owned is a darker, OMYW romance novella with steamy scenes and a very happy HEA.